The 2019 Smart City Summit & Expo (SCSE), which includes four sub-expos, will take place at Taipei Nangang Exhibition Center from March 26 to March 29, and is set to bring together some 36 artificial intelligence (AI) startups from around the world to showcase their latest technologies. As Asia’s largest smart city trade show, this year the event will feature the application of AI technologies in different fields such as transportation, healthcare, education, energy efficiency and sustainability, and architecture. Industry leaders and participants can meet up and exchange views at the main exhibitions, forums, and networking events. Cheng Yu, head of the event host Taiwan Smart City Solutions Alliance (TSSA) and chairman of Chunghwa Telecom, said the show is expecting more international visitors this year, approximately a 30 percent increase from last year, with over 1,700 international professionals from 42 countries already signing up for the event. Cheng added that the visitors will include business delegations from Malaysia, Thailand, the Philippines, Vietnam, Myanmar, Indonesia, India among others. Over 150 representatives from more than one hundred cities in the world are to take part in the Smart City Mayors’ Summit March 26 and attend the launch alliance of the Global Organization of Smart Cities (GO SMART) initiative March 27. This year’s event features 337 exhibitors from around the world, showcasing a diversity of smart applications and solutions at approximately 1,250 booths. A total of 66 professional forums will be held during the event, and 43 of them, or 65 percent, will be conducted in English. 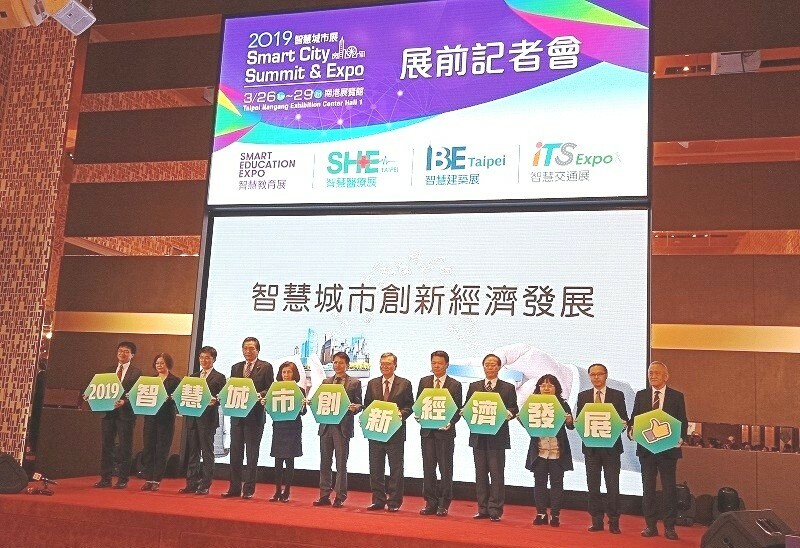 The sub-expos are Smart Healthcare Expo (SHE Taipei), Smart Education Expo, Intelligent Building Expo (IBE Taipei), and the newly-added Intelligent Transportation System Expo (ITS Expo). To tap into the potential of AI and machine learning for business, the AI 50 Inno-Convention is first introduced to the show, with 36 AI startups selected from 52 submissions from around the world to exhibit at the AI 50 Pavilion and to join a variety of business matchmaking and networking events. The new event is aimed to boost AI development in the country and create opportunities for an innovation-driven smart city ecosystem. The participating AI startups will include AIMobile, Airhost, Beseye Cloud Security, Bosonit, Bovia, Nadi System, Nanoprecise, Newsight imaging, Aindra Labs, Cognidis, Incubit, Mapple Analytics, oToBrite Electronics, Strelka KB, ThinkLABs JSC, Verdigris Technologies, aetherAI, AI4quant, DIABNEXT, iinumbers, Safehouse Technology, Soteria Biotech, UMAY, Komerco, Moodbit, Osense Technology, Skopai, Skymirror, Symaps.io, ThinkTank, Yoctol.AI.